On 22 October,2018 Md. Mosharrof Hossain, Director-Finance of BURO Bangladesh signed the agreement on behalf of BURO Bangladesh’s head office amid the presence of Kamal Quadir, Chief Executive Officer of bKash and Zakir Hossain, Executive Director of BURO Bangladesh, along with senior officials of the both organizations. 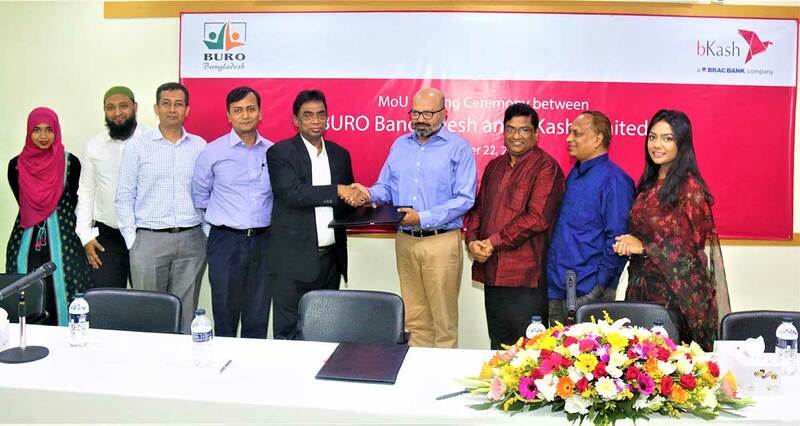 Established in 1990, BURO Bangladesh, a leading NGO-MFI working for economic and social development of 1.7 million households across the country allowing to leverage bKash for loan disbursement and repayment service for its customers. The fund transfer will significantly reduce the cost and time for both BURO Bangladesh and its beneficiaries.